Valentine's Day is the perfect time to make a restaurant-caliber meal at home—especially if you just realized it's on Friday and there are no good dinner reservations left. Modernist cooking enlists techniques that require less active time cooking, while still producing rich flavors—just the sort of thing needed to create a memorable dinner that you can actually enjoy making. The Modernist Cuisine at Home Lite app, a free preview of their $79.99 app, features several dishes perfect for Valentine's Day. They're sharing some recipes exclusively with Gizmodo, like this week's idea to use a pressure cooker for a romantic dinner for two. Cooking a multi-course meal can plague some of us with anxiety; we feverishly check food wondering, "Is it cooked enough?" and watch the clock tick as we wait for sauces to reduce and flavors to develop. Pressure cookers remove a lot of that anxiety by developing the characteristic flavors and textures of food so quickly that what is conventionally a long, labor-intensive process becomes one hardly more time-consuming than a casual sauté. For example, an intense chicken stock takes 90 minutes instead of two or three hours. 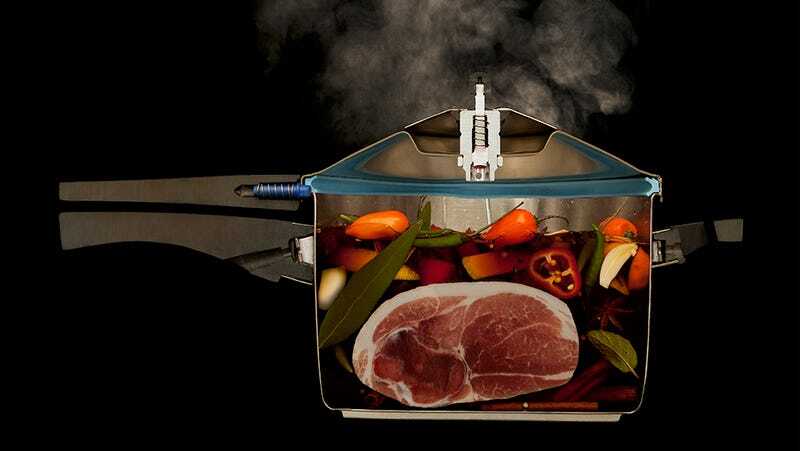 A pressure cooker works by capturing steam that, as it builds up, increases pressure in the vessel. The pressure increase in turn raises the boiling point of water, which normally limits the cooking temperature of wet foods to 100 °C / 212 °F (at sea level; the boiling point is slightly lower at higher elevations). Because the effective cooking temperature is higher in the pressure cooker—as high as 120 °C / 250 °F—the cooking time can drop substantially. The high temperatures inside the cooker also promote browning and caramelization, reactions that create flavors you can't get otherwise in a moist cooking environment. Something magical happens when you combine chopped carrots, butter, a little water, and a pinch each of baking soda and salt in a pressure cooker for 20 minutes. At a slightly alkaline pH of 7.5 (because of the baking soda) and a temperature of 120 °C / 250 °F (from the pressure), the caramelization reactions flourish. The result is a terra-cotta-colored mixture that is the concentrated essence of caramelized carrots. Now that you understand the technique, try your hands at these recipes. You can find these recipes in the free Modernist Cuisine at Home Lite app plus many more in the full $79.99 version.